Here at The Amazing Blog, we know how over time our skin can suffer, so we are always looking for new products that help bring back that youthful glow. So when we received the Eye Serum and Active Serum from the award-winning Californian skincare brand AQ Skin Solutions, we couldn’t wait to try them out. AQ Skin Solutions was created by Dr Ahmed Al-Qahtani who formulated this range by using cutting-edge technology (detailed here). He was inspired to start AQ Skin Solutions from conducting extensive work in medical applications of Growth Factors (GF) for healing wounded tissue and creating artificial skin grafts. We first tried out the Eye Serum, the benefits of this product include smoothing the appearance of wrinkles and fine lines, brighten the appearance of dark circles and reduce signs of puffiness around the eye area. What we particularly like about this moisturising formula, is that it feels gentle on the skin, they say that it also won't irritate even the most sensitive eyes. The concentrated GF technology blend stimulates collagen production for increased firmness, while several smoothing peptides help tighten and lift the skin. Through activation of the skin’s own damage repair processes, fine lines and wrinkles are smoothed. It increases micro-circulation and lightens the under-eye area and helps to clear up eye bags and dark circles. The product is non-greasy, which means it won't clog the pores. We also like the handy 15ml bottle and the sleek packaging. We were also lucky enough to receive the Active Serum. The serum also contains stem-cell derived growth factors to renew and accelerate skin cell regeneration. This helps erase the signs of ageing and environmental damage for a firmer, smoother complexion. Daily use of the serum helps minimise the look of fine lines and wrinkles. We used it not only on our face but also on the neck and decolletage areas too. The GF technology contained in both of these products is also being used successfully for encouraging healthy hair growth, reducing the appearance of scars and shortening the healing time of burn wounds. They say about using this serum: "Optimal improvement to your skin is generally not reached until six weeks of daily use." We only managed three weeks, but were pleased with the results. We're happy to say, that by using both these products our skin felt softer, eyes looked brighter and it helped to give us back a more glowing complexion. All AQ Skin Solutions products are paraben, sulfate and phthalate free as well as cruelty free. 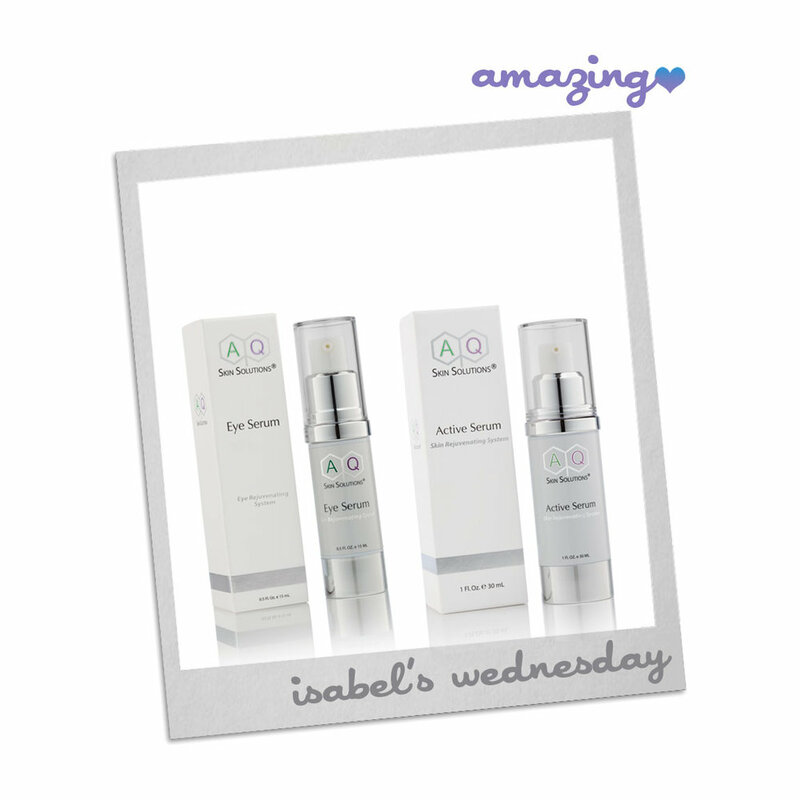 You can purchase the Eye Serum here for £99 and the Active Serum here for £157.